When water and salt connect, the negative poles of the water molecules surround the positive ions in the salt. and the negative ions in the salt are surrounded by the positive polarized particles of the water molecules. This changes the geometric structure of the water and the salt, and creates something entirely new, a third dimension. The water is no longer water and the salt no longer salt. The crystalline structure of salt, as sole, has such a lasting effect, that its frequency can be maintained within our body for over 24 hours. Sole will give our body the exact vibration that it is missing. For sole therapy the quality of the salt used to make it is more important than the quantity of sole you drink. Drink one teaspoon of sole in natural spring water every morning on an empty stomach. Again it is not the quantity that you consume, but regularity with which you consume it. Bio-chemically, the stomach and intestinal activity (peristaltic) is stimulated within minutes, which in return stimulates your metabolism and digestion. Electrolytes are created which improve the body's conductivity and stimulate the circulation. Salt allows the current to flow. Drinking sole can loosen and break down deposits in the body, it dissolves and releases crystallized deposits, the cause of rheumatic diseases and kidney and gallbladder stones. It also weakens addictions and cleans the intestines and heals skin diseases. 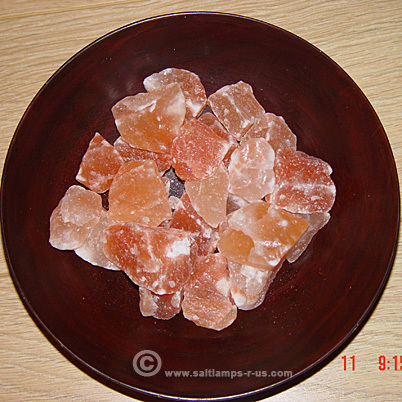 Place several pure crystal Himalayan salt chunks (see pic.on the right) on in a small glass jar with lid, preferably glass but not metal. Plastic is ok. Cover the salt crystal with pure, living spring water, like FIJI water or your quartz crystal charged spring water. After about two hours, check to see if the crystals have dissolved. If they have completely dissolved, add another crystal salt stone. Keep doing this until the water can no longer dissolve any more salt, and the crystal salt stones remain sat the bottom of the jar. The water has reached its 26% salt saturation level. You now have sole. At this point the salt crystal will no longer dissolve until you add more water. Once the solution arrives at 26% (26parts of salt to 100 parts of water), it is saturated and becomes sole. Therefore, you must look to see that there are always salt crystals remaining at the bottom of the jar, as an indicator that this solution is saturated. You can always add water to the jar to replenish your supply of sole. Just remember, once the crystals have fully dissolved, you must add more crystals so that there are always undissolved salt crystals left in the Sole. In this way you always know that the sole is fully saturated. This jar of sole doesn't need to be stored in any special manner, wherever it is convenient for you. The sole is a sterile solution and naturally prevents all kinds of germs, viruses, bacteria or fungi from forming in the jar. Add one teaspoon of sole to a glass of good quality spring water. Drink this every morning on an empty stomach. If the cleansing effect is too intense you can reduce the amount of sole to couple of drops, rather than a teaspoon per day. This depends on your individual constitution and judgment. For children and babies, few drops of sole in a glass of live spring water are sufficient. The less salty the sole solution, the more likely your child is to drink it. Adding a couple a couple drops of sole to your child's meal is adequate. The frequency pattern of the salt in the sole will be retained in your body for up to 24 hours. All the research and information that follows is done by Dr Barbara Hendel and Peter Ferreira in their book 'Water & Salt The Essence of Life'. A must and highly recommended read, as from the first day that this book was introduced in Germany it was an immediate bestseller. Millions of people have changed their lives in respect to water and salt with profound scientific information presented herein in an easy to read format that everyone is able to understand. You will find many more tips and information in the book. For inhalation therapy, the ratio between water and salt should be at least 1% which equals to 0.35 ounces of salt per quarter of a gallon of water. However, experience has shown that especially with diseases affecting the deeper respiratory pathways, higher concentrations of up to 8% achieve better result. The concentration should be slowly increased, starting with a 1% sole solution. • Fill a wide pot or pan with one to two quarter of a gallon and heat until it begins to steam. • Add at least 0.70 ounces of coarse or crushed salt. After the salt dissolves, cover your head with a large towel and, holding your face over the pot far enough so as not to burn yourself, inhale deeply. • Following the inhalation, the respiratory organs need approximately 30 minutes to accumulate and bind the pollutant in mucous so it can be coughed up. This procedure can be repeated several times a day according to your needs, until the symptoms recede. For sinus flushing, use a neti-pot which is designed specifically for this function. For this application of sinus flushing, prepare a 1% sole solution by dissolving 0.35 ounces of crystal salt in 3.4 ounces of lukewarm water. This concentration is equal to the salt concentration in our body fluids and hence does not irritate the nose as does seawater. This application can be repeated as often as necessary but usually twice a day is sufficient to keep your sinus clear. • Lean your head over the bathroom sink and apply the beak of the neti-pot into your nostril. Keep your mouth closed. • Slightly lean your head forward and bend it to one side. • The sole will flow through your nostril and come out of the other nostril. Repeat this procedure with the other nostril. • This 1% sole solution is also excellent for gargling when infections of the mucous membranes in the nose, mouth and throat areas. 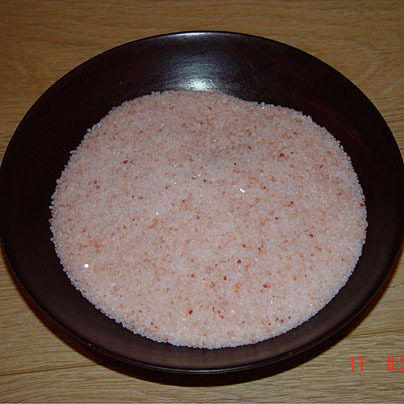 In contrast to a normal bath, in which moisture is extracted from the skin, a sole bath allows salt to be stored in the upper callous layer of the skin and binds water. This maintains the natural, protective film of the skin, protecting ig from drying out. This is the reason why sole baths are good for dry skin as well. The cleansing effects of a 30-minute sole bath equals those of three days of fasting. The toxins are released into the bath water through osmosis, while the minerals from the sole are absorbed through the skin. This reduces the acidity in our body and balances the pH factor of our skin. It has proven that having a sole bath can be effective on many skin diseases. The sole bath should have a minimum slat concentration of 1%, for an average bathtub with 28 gallons capacity you would need 2.35 pounds (1 kilo) of crystal salt. If your tub had a larger capacity, you would accordingly need to use more salt. The formula for a 1% solution is 1.28 ounces of salt per gallon of water. The bath water should have a temperature of approximately 98.6F, our normal body temperature. Check the temperature with a thermometer. This is important, as the body must not additionally sacrifice its own energy to balance out the temperature. • Do not use any bath additives, soaps or oils. • You should soak between 15-30 minutes. • Do not shower off, simply dry off with a towel. • After the sole bath you should rest at least 30 minutes. For open wounds use only a 1% sole solution. For injuries of the soft tissues or ailments of the joint you can use a sole concentration between 3% and 10%. Cold thigh wraps soaked in sole are most effective for lowering fever. Use a clean linen or cotton towel and soak it in a sole solution of recommended concentration; wring it well and wrap it around your thighs. The accelerated growth of the topical of skin forms red spots, which are usually covered with a thick layer of white flakes. Psoriasis can cause severe itching. It is a genetic disease but this doesn't rule out the possibility for completely healing the disorder. An alkaline -forming, vegan diet, in combination with salt therapy, can work wonders. Allopathic medicine is familiar with the healing effects of salt therapy for psoriasis, In many cases doctors prescribe bathing in highly concentrated bodies of salt water, like the dead sea, with the highest salt concentration on Earth. However, these treatments only provide temporary relief, and the symptoms reoccur when the patient returns home. Now, we can bring the ocean in to our homes. • Drink one teaspoon of Sole in a glass of living spring water every morning on an empty stomach. A few drops of sole are sufficient for babies. • Drink two to three quarter of a gallon low mineral and non-carbonated water per day. • Since the skin of a person suffering from psoriasis is usually not open, but infectious and thickened, a higher concentrated sole bath is recommended. Begin with a 3% solution or 3 kilos of salt in 26 gallons of bath water. The concentration can be increased up to 8% 7.5 kilos of salt. The sole bath adds moisture to the skin and alleviates the infection. • Make sure that another person is around to help you in case of circulation problems. • Do not rinse after bathing; gently dab you r skin dry. • Take a sole bath twice per week for about 10 to 20 minutes. • Undiluted, saturated sole can be directly applied to the re spots. Additionally, you can apply a concentrated Sole Wrap on those areas. The application of a Water&Salt Peloid mask (Sole Mud) is helpful, too. Apply the sole-mud thinly on the troubled skin spots and let it dry. Wash it off after 15-20 minutes. You can repeat this procedure on a daily basis until the spot have disappeared. • Please remove all make-up thoroughly before washing the eyes. • Pour a 1% sole solution in to the eye-wash cup and hold the cup close to your eye so that no liquid can escape. • Gently tip your head back, washing the solution over the eye while simultaneously opening and closing your eye repeatedly, so that the sole solution can saturate your eye. • While keeping your eye open, roll it around for several minutes. Because the 1% sole solution equals the salt concentration of your tear fluids, this eye-bath will not burn or sting. • Apply a peloid mask (sole mud) twice a week and let it soak in for 15-20 minutes before removing the mask with a wet washcloth. Initial worsening of the skin's condition is possible. However, once this phase passes, the skin improves dramatically. Topical application of sole are mainly used for skin diseases, injuries, insect bites pain and injuries of the soft tissues, and joints as well as face skin. Only apply 1% sole solution. Topical applications of sole regulate the storage of fatty tissue and balance of the pH of the face skin. Only apply 1% sole solution. You can also apply the sole in concentrations up to 26%. The sole can be applied as often as needed. You can also apply a sole topical to severely infected areas. Contrary to common table salt, sole is not "off limits" for those with high blood pressure. In fact, sole lowers the blood pressure within 15 minutes. But this does not mean that sole is a blood pressure lowering remedy. Because those with low blood pressure can also drink sole and their blood pressure will rise. The sole's fundamental attribute is its ability to restore balance. If people with high blood pressure are advised to refrain from using salt, which salt are they referring to? For common table salt, this is true. But not for the salt having holistic properties. Very often, a lack of salt in our body can have negative effects, Again, when we speak of salt, we are talking about real, whole, pure crystal salt. • A crystal salt bath will alleviate the itch. The concentration of salt depends on the condition of your skin. If you have any open sores, please only use a 1% concentration=one part salt to 100 parts of bath water or 1 Kilo of salt in 28 gallons of water. A children's tub holds about 5-8 gallon of water in which you would put 7-10 ounces (weight0 of salt. • You can increase the concentration up to 5%. Besides alleviating the itch, a sole bath also adds moisture to the skin and relaxes the central nervous system. • Initially, your skin condition may take a turn for the worse, and diarrhea is a common side effect. But don't worry. This will soon pass and is a positive sign that the intestine is getting rid of putrefied and fermented substances. For a severe condition, take a sole bath twice a week, after the skin has normalized, taking a sole bath once to twice a month is sufficient. • Drink one teaspoon of Sole in a glass of living spring water every morning on an empty stomach. • Treat yourself to a sole bath every once in a while. A 1% sole solution in 98.6F degrees water is sufficient. Try to forget your problems while you are relaxing in the tub, listen to some soothing music. • If you spend a lot of time in front of a computer using a salt crystal lamp next to the monitor is recommended to bind excess positive ions that are causing damaging electro-smog. A salt crystal lamp builds up a neutral vibration pattern in the room. • Crystal Salt Lamps also help to create a healthier electromagnetic atmosphere in the room. • Bath your feet in a concentrated sole solution, starting at 10% lightly towel your feet dry without rubbing. • If the skin is unopened, apply pure sole on the fungus and let it absorb into the skin. • Apply Water & Salt Peloid mask on to the blisters before going to bed and leave it on over night. Rinse it off in the morning. The salt dries out the blisters, kills the viruses and regenerates the skin. The salt socks has proven to be effective for treating gout and chronically cold feet. Soak a clean pair of cotton socks in 2-4 table spoon of crystal salt in 1 quarter of a gallon water. Wring them well, put then on and wrap your feet in a dry towel. For full effect of this application, keep them wrapped on for one hour. Sore feet is a common problem. Especially for women after parties due to wearing high heels. Add lukewarm(bearable) water in a small tub. Add 250g of pure Himalayan crystal bath salt in the water. Keep your feet in the tub for 15-30 minutes. • Dab the wart with pure sole or make a pure sole wrap. • Apply Water&Salt Peloid mask on the warts and wrap a moist towel or linen around it. • If the warts appear on feet or hands, it is recommended to soak then in a highly concentrated sole solution of at least 10%. Do not rinse the salt solution after soaking and lightly towel dry without rubbing.Some warts can disappear within few days. Salt is a natural deodorant. Through its disinfecting and neutralizing effect it prevents the forming of germs and bacteria that cause unpleasant body odor, when the body is not alkaline. Germs and bacteria can germinate quickly in an overly acid environment. Take a stone of crystal salt, lightly moisten it with water and apply it as your would any under-arm deodorant". • Sole is also suitable for use in inhalation devices. The temperature of the solution should be between 93.2F and 98.6F. • The crystal salt lamps has been especially helpful for people with asthma. • Bath in a 1% sole solution once a week to relax and reduce the stress in your body. • If your eyes are affected, wash your eyes several times a day in 1% sole solution. Don't worry; the sole won't burn since it has the same salt concentration as you tear fluid. • Perform a sole inhalation therapy once or twice a day with a 1% sole solution. the sole concentration can be increased up to 3%. • Gargle with a 1% sole solution, This moisturizes the infected mucous membrane and loosens bacteria and viruses; the salt disinfects and regenerates the mucous membrane. Repeat this process several time a day. • A cold throat wrap with highly concentrated sole will alleviate the soreness. Soak a towel in pure sole, wrap it around you neck and, , further wrap a dry towel around that. Keep it around your neck for one hour. Lightly rub the insect bites with pure sole several times a day or wrap them in a sole saturated cloth. This alleviates the itch and removes the swelling. Water & Salt peloid mask is another effective remedy, Apply some peloid to the bite and let it dry. Rinse it off after two hours and repeat as often as needed. With all rheumatic illnesses the sole drinking therapy should be continued for a minimum of three months in order to hold this particular frequency pattern in the body. Slowly, the body starts to break down, metabolize and excrete the crystalline deposits in the joints. This process will initially aggravate the symptoms and pain. In order to minimize these effects, it is recommended to drink liberal quantities of good quality, living water that is low in minerals. Only this kind of water can support the body in removing the loosened toxins. The more water we drink the less pain we will experience during the initial aggravation of the symptoms. • If you are already experiencing the symptoms of the infection but do not have fever or jst a slight increase in temperature , take a 1% sole bath in 98.6F water for 20 minutes. Through osmosis, the body releases toxins and absorbs energy and minerals from the sole. • If you have a fever, sole bathing is not recommended. • Instead soak your feet in a 1% sole solution. • Cold sole soaked thigh wraps are very effective for lowering fever. • After several months of sloe drinking therapy, gallstones may be broken down (if you have any) and passed through urinary tract, which can sometimes be very painful. In case of liver and gall bladder problems, cramps in the stomach/intestine are, a warm sole wrap will alleviate the pain. Use 1pint of very warm water and 1.8-3.5oz of crystal salt. Soak a cotton towel in the sole solution and place it on the painful area. Place a dry towel over your belly and rest for 30minutes. • Wrap a towel soaked in a highly concentrated cold sole solution around the injured area and wrap a dry towel around it. It is recommended to repeat this process several times a day. • For problems with yeast infection, dry mucous membranes, or other infections, a sole bath for the lower half of your body is recommended. Choose a salt concentration between 3% and 8% in a 98.6F temperature water. Crystal salt is excellent for oral and dental hygiene. 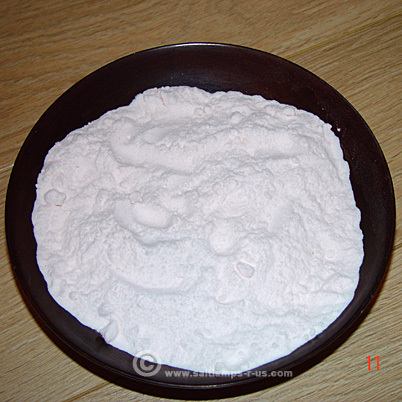 It slows the formation of tartar and prevents cavities. Most dental decay is caused by overly acid mouth and throat flora. Even in instances where tartar is present, sole can remove it. The crystal salt brings your mouth flora back into a neutral, balanced state and will heal existing illnesses, rot or decay and prevent future occurrences. Brush your teeth every morning with a sole concentration of 10 to 26%. Swish it around in your mouth for three minutes before re-spitting it out. • If you are experiencing pain in your kidney areas, use hot moist, sole soaked wraps. • You can also use a heated crystal salt sachet on the painful areas. Many people have accumulated heavy metals in their body such as lead, cadmium, arsenic, palladium, amalgam or mercury, without knowing it. Our soils are polluted with the toxins, as are our teeth. They are a burden to our system because it is extremely difficult for our body to eliminate them. The consequences can include headaches, exhaustion, depression, loss of vitality and such. Crystal salt can help remove these toxins from our body. For heavy metals rink one teaspoon of sole in a glass of water evry day on an empty stomach. It is important to drink plenty of good water that is low in minerals throughout the day. In this way your body can quickly flush the dislodged, ionized and metabolized heavy metals before they can e re-circulated through your system. Drink one teaspoon of Sole in a glass of living spring water every morning on an empty stomach. Drink two to three quarter of a gallon low mineral and non-carbonated water per day. (CAUTION) If you are among the 3% of people whose blood pressure is sensitive to salt intake, you should use sole in drops only and consult your physician first. We do not recommend you substitute any prescribed medicine without professional advice. If you are taking any medication please check with your GP before trying any alternative remedies. Some prescribed medication can be affected by alternative remedies. We make no claims to the therapeutic effect of any product listed on this website. All our products have not been scientifically tested but have been used successfully by many worldwide. These products are not intended to diagnose, treat, cure or prevent any disease. Information and statements made are for educational purposes and are not intended to replace the advice of your health care professional. Salt Lamps R Us Co Uk (Amanis) does not dispense medical advice, prescribe or diagnose illness. We sell natural health products that may assist the body in its efforts to rebuild and heal itself. © 2016 Saltlamps-R-Us. All rights reserved.